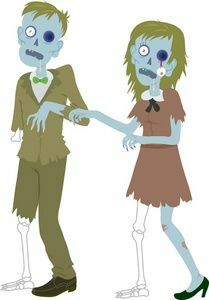 In honor of the newest season of the Walking Dead I got to thinking about zombies…..
What, if any, are the fundamental differences between a mindless zombie and a parent, especially the parent(s) of a small child or infant? Diet: You mindlessly eat whatever crosses your path, not for fun, but for sustenance. Odor: You’re not exactly sure what the smell is, but you are absolutely positive it is coming from either you or your clothing. Facial Expression: The lost, vacant expression on your face. I wish I could tell you otherwise, but that expression is here to stay. Movement: The “Shuffle”. It’s a technique mastered by parents to avoid the late night Lego land mines. Shuffling allows the foot to roll over the Lego instead of stepping on it, which would result in a level of pain not yet describable to the medical world. Brain: The ability of your brain to function off of little to no sleep, therefore relying on your primal instincts to keep going. Odor: You are the smell. Hair: Just as with a parent your hair is a poor matted, tangled, something rabid nested in it mess. Actually something probably is nesting in it. Speech: The unintelligible jargon you think passes for actual human communication. This is the result of the speech part of your brain no longer working as you are a zombie. Or a parent. The 2 are easily interchangeable as you can see. Facial Expression: Lost, vacant expression on your face. Movement: The “Shuffle”. This has nothing to do with late night legos. Apparently this is just the way zombies walk. I mean really, you’re dead, why should you hurry anyway? Brain: The ability of your brain to function off of little to no oxygen, therefore relying on your primal instincts to keep going. Winner? Zombies in my opinion!